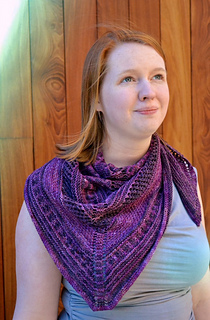 Hue and Value is a pretty way to experiment with simple stitch patterns and textures, and to let two coordinating yarns play and mingle with each other. 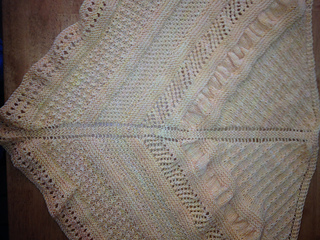 Choose two yarns with similar shades for a subtle effect, or choose contrasting colours for more punch. 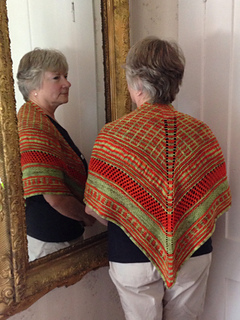 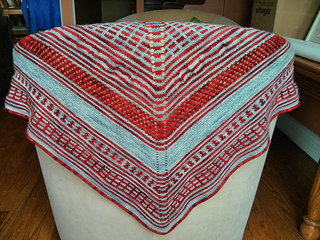 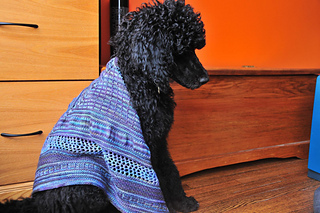 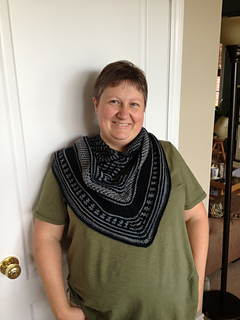 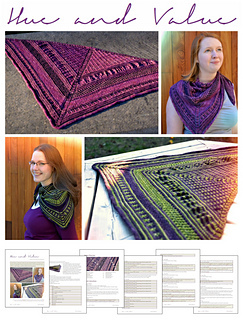 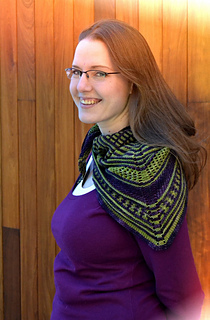 Work the shawl as written, or make it larger or smaller by adding or eliminating sections. 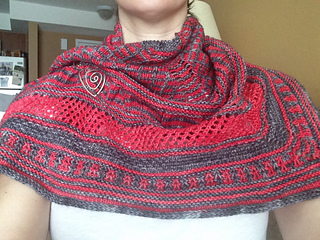 The shawl is worked with two yarns, but there’s no stranded colourwork involved -- all of the textural effects are created with simple striping and slipped stitches, plus a little dash of mesh lace. 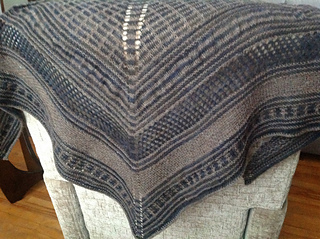 The bind-off is done with applied i-cord for a tidy edge. 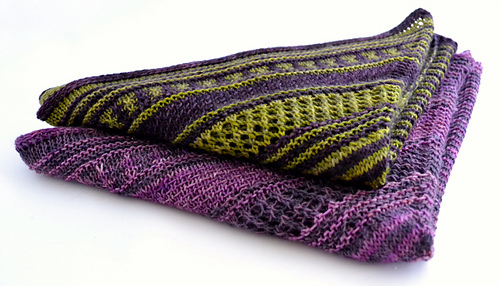 In the purple and green sample, both yarns are String Theory Caper Sock. 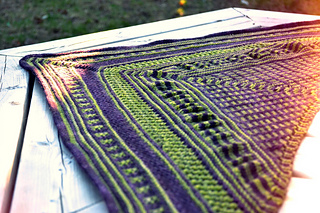 The purple is Black Tulip (MC) and the green is Peridot (CC). 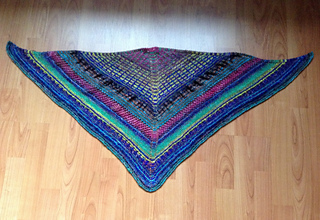 The final shawl measures 117 cm / 46” across the wingspan, and uses approximately 58 gr of each yarn. 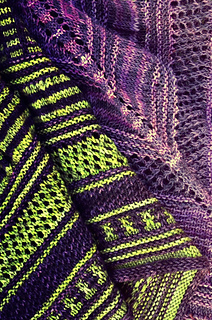 In the purple sample, the pinker yarn is Viola Sock in Violet (MC) and the darker yarn is iPaint (uKnit) Handpaint Originals 2-Ply in Purple. 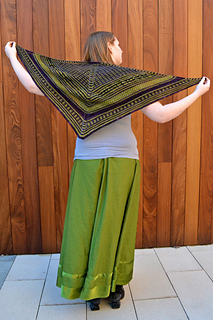 (Unfortunately, neither is commercially available any more, to the best of my knowledge.) 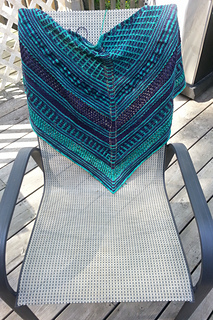 The final shawl measures 122 cm / 48” across the wingspan, and uses approximately 59 gr of each yarn.